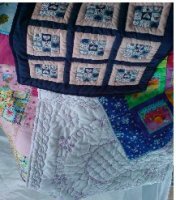 For parents of stillborn babies these quilts are very much appreciated and treasured for years to come. A lot of people ask me what size they need to be. Well size is not crucial for this. However about 2ft square is a good size, but smaller is fine too. They need not even be square or oblong – you could even experiment with round or oval if the muse takes you. If you want to try out some techniques before starting larger projects you could use your practice pieces to make up some quilts for this purpose. If you contact Pat Lowe (email: tricialnq@aol.com – Please make the subject Last Cuddle; Mob: 07930 917343 she will be happy to deliver them).